ruthdelacruz | Travel and Lifestyle Blog : What is a Healthy Deal? What is a Healthy Deal? Discounts. Sale. Bargain. 50% Off. 90% Off. Deals. Don't we get excited when we see those terms? Like a woman marrying the man of my dreams, I would say with conviction "I do". I do get excited when I see those words. I can feel my heartbeat and blood rushing through my veins. Healthy. Wellness. Good. Balanced. New terms and words that majority of the market is seeking and trying to achieve. Put the two concepts together, the Healthy Deals Philippines is born. Healthy Deals Philippines is the newest and the only group-buying site in the Philippines that offers health and wellness deals, coupons and discounts exclusively to its members. We know how much I loooove Groupons or Group Buying Sites. I cannot count the number of deals I had bought online. I have liked all of them in Facebook and even subscribed to their newsletters. I felt that the deals which are most at 50 to 90% discount are "healthy" in my pocket. But that is what I thought. How can I say the deals are really good?! I bought a lot of hotel buffet deals, whole cake discount offers, and a lot which would translate obesity, hypertension and diabetes. That makes Healthy Deals Philippines different. All the deals that is on the site are certified healthy for one's finances and wellness. 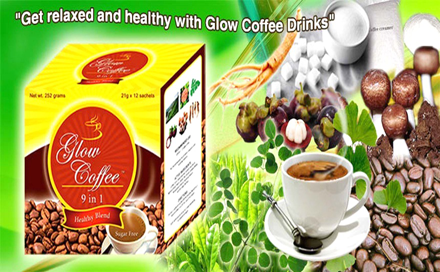 Take for example this Healthy Coffee from Businesspeople Inc at 50% off (from Php200, now Php100). I think I would need to buy a pack especially that I work at night and sometimes, having 6 hours of sleep is not enough for my brain to function. I don't want to be too selfish on this new discovery so I am blogging about this and joining the “What’s a Healthy Deal?” Bloggers Raffle Contest (which also gives me a chance to win an iPad2) - I hope the law of attraction works this time! 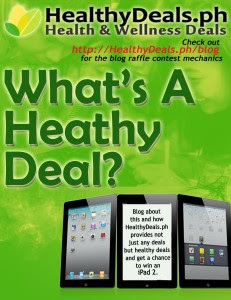 © ruthdelacruz | Travel and Lifestyle Blog : What is a Healthy Deal?